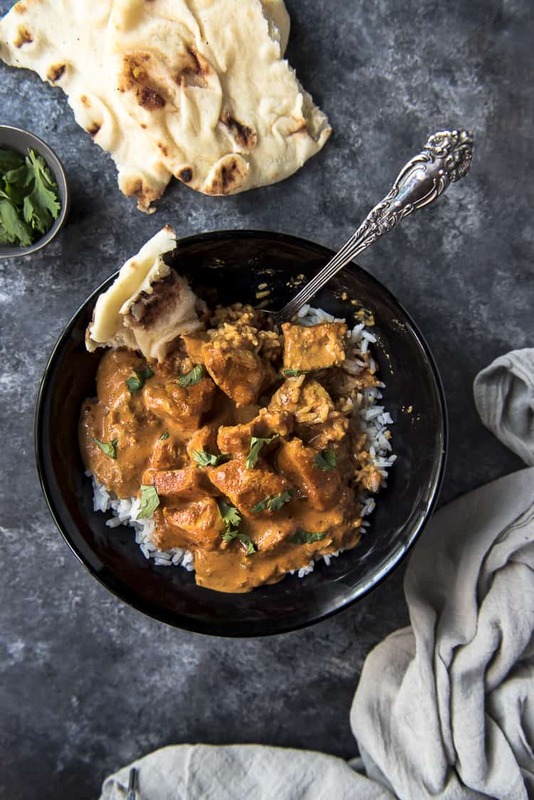 Skip the takeout and whip up this easy Chicken Tikka Masala on your stovetop at home! Tender yogurt-marinated chicken, bursting with ginger, garlic, and Indian spices in a deliciously creamy tomato sauce – it’s perfect for mopping up with a batch of naan bread on a cool night. Guys, I’ve found a new dinner winner with this recipe. I’m pretty sure that one bite is all it will take to convince you. I made this chicken tikka masala on a whim one day when Abe told me he wanted something different for dinner. Something that I’ve never made before. I had to really wrack my brain to come up with an easy, tasty recipe that would fit the bill. Being an Indian food novice, I found a base recipe online and just rolled with it. The one ethnic food I never attempted was Indian because…well, I’ve never really care for it. It only takes one blah food experience is often enough to turn you off to things, which is what happened with Indian cuisine. Until this life-changing tikka masala, at least. JUST TAKE ME TO THE CHICKEN TIKKA MASALA ALREADY! If you’d rather skip my (pretty darn helpful) tips and tricks, essential cooking info, and similar recipe ideas – and get straight to this deliciously easy chicken tikka recipe, just scroll right on down to the bottom of the page where you can find the printable recipe card! Yogurt marinated chicken was a weird concept to me, but you won’t believe how tender it is! And the longer you let the chicken sit, the more developed the flavors become. I made my own garam masala blend in this recipe instead of using the store-bought jar. I often find the ratio of cloves to everything else to be off. 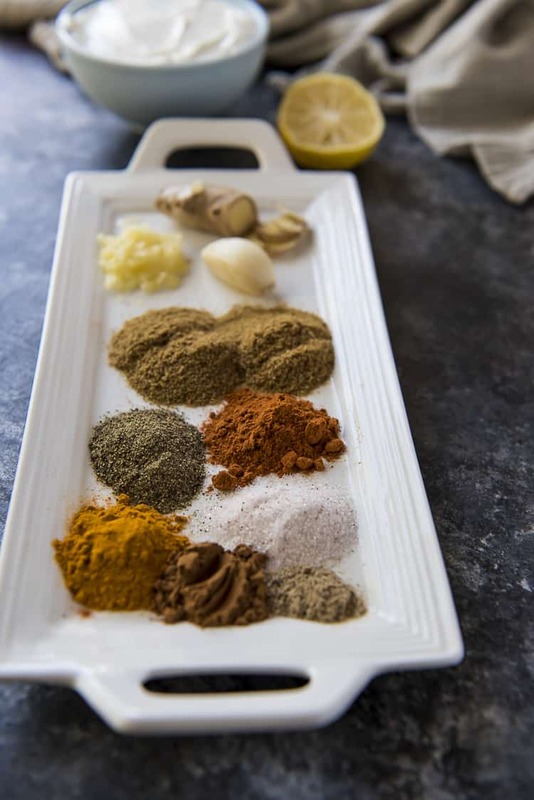 Choosing your spice blend really makes this recipe your own, so feel free to adjust it based on your tastes. In addition to my first masala (and to my own delight), I also made homemade naan bread, of which I was super proud. I baked it in my oven, right on my pizza stone (to mimic a tandoori oven) and I was so thrilled by how perfect it was, imperfect as it looked. 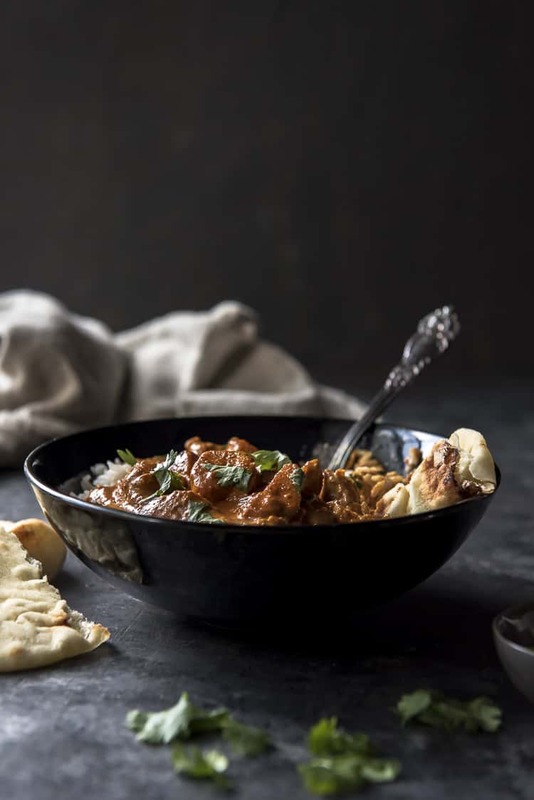 I’ve made this tikka masala many times since that first magical night, and this adaptation is now my go to combination of spices and flavors, not to mention one of our favorite meals. Are Chicken Thighs or Chicken Breasts Better For Tikka Masala? I use chicken breasts here, but feel free to use your favorite cut of chicken in this tikka recipe! Chicken thighs tend to be more moist and juicy than breasts, meaning less marinating time (10 minutes minimum vs. 1 hour for breasts). If you do decide to use breasts, marinate them for as long as possible to allow the flavors to really soak in. 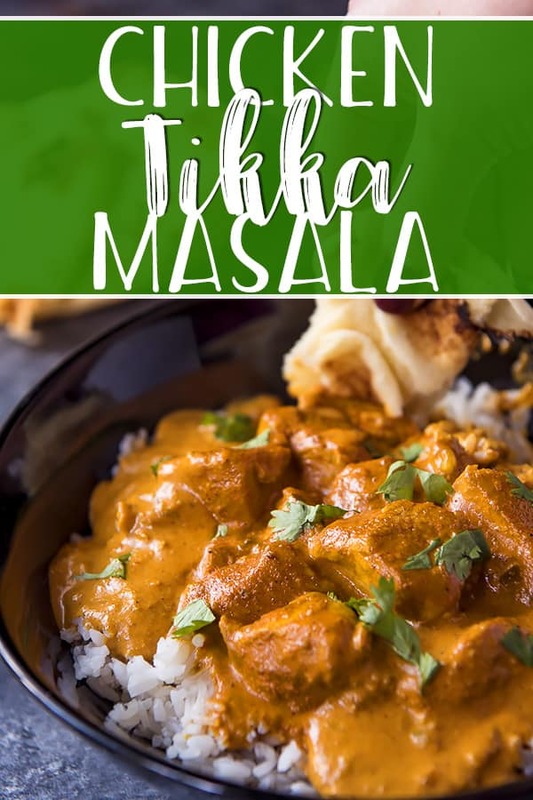 What Flavors Go Into Tikka Masala? 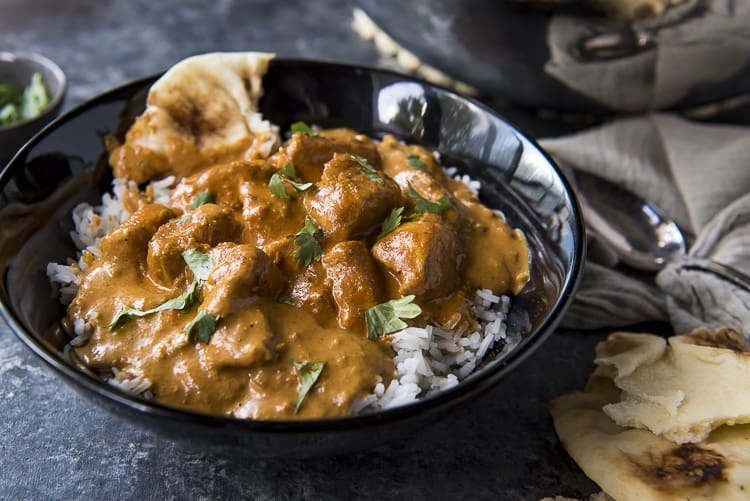 What’s The Difference Between Chicken Tikka Masala and Butter Chicken (Makhani)? 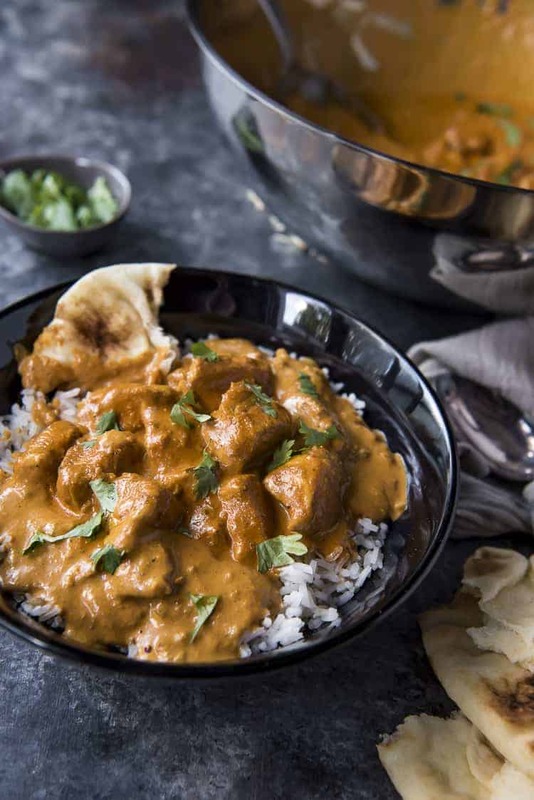 Butter chicken, a native Indian dish, tends to have a sweeter flavor, and is made with lots of cream and butter (makhan). Very little (hot) spice go into this dish, as the flavor profile is more centered on the butter “gravy” sauce. Tikka Masala, the national dish of the U.K., is the spicier of the two dishes. The chicken used in it is marinated in a spice (masala) and yogurt or sour cream base, and the tomato sauce it is cooked in can be made with coconut milk or cream. What Are the Best Side Dishes To Serve With Tikka Masala? 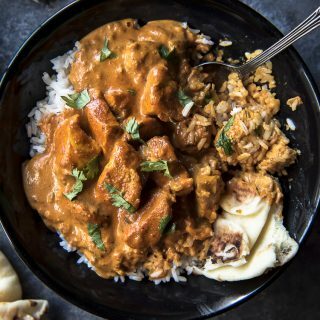 Is Chicken Tikka Masala Keto? 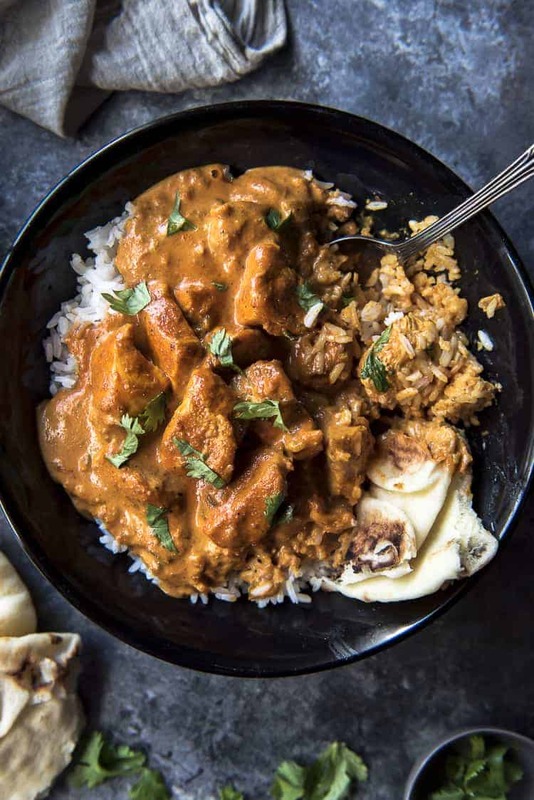 In its original state, tikka masala is MOSTLY low carb. A few tweaks to the base recipe will make this meal a keto-friendly dinner. Use deboned, skinless chicken thighs over chicken breasts. Instead of using yogurt in the chicken marinade base, use sour cream. Sour cream has more fat than yogurt, which is key in a keto recipe. Substitute the basmati rice with cauliflower rice. If you must have something to soak up the sauce with, try some lavash bread instead of naan. 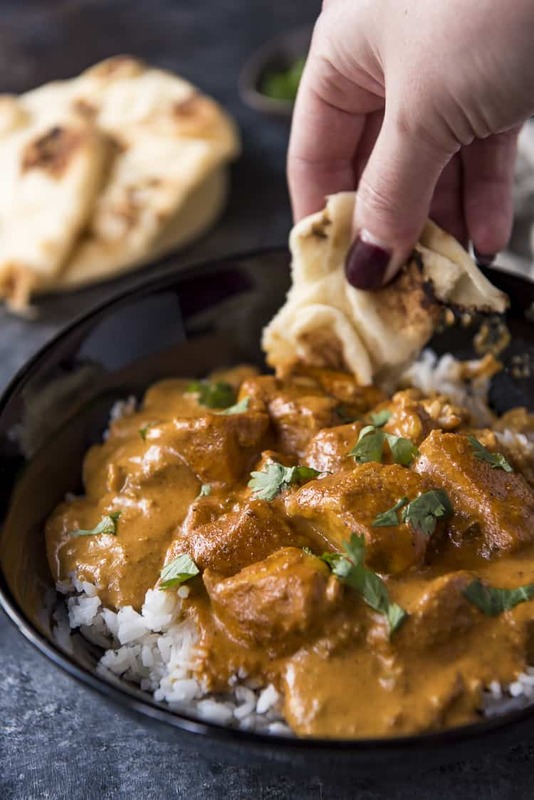 Skip the takeout and whip up this easy Chicken Tikka Masala on your stovetop at home! Tender yogurt-marinated chicken, bursting with ginger, garlic, and Indian spices in a deliciously creamy tomato sauce - it's perfect for mopping up with a batch of naan bread on a cool night. In a bowl or plastic zipper bag, combine yogurt, lime juice, ginger, spices, and cubed chicken. Toss to combine. Refrigerate for 10 minutes (thighs) to 1 hour (breasts), or overnight. Melt 1 tablespoon ghee in a large skillet or Dutch oven set over medium heat. When sizzling, add chicken pieces in 2-3 single-layer batches batches. Cook 3-4 minutes until browned on both sides. Transfer to a clean bowl or plater and set aside. In the same skillet, melt remaining ghee. Saute the onions and jalapeno 2-3 minutes until soft. Add the garlic and cook 1 minute until fragrant. Stir in the paprika, cumin, and salt. Add the chicken broth and scrape the browned bits off the bottom of the pan. Add the tomato sauce and cream and stir well. Lower heat to low and allow sauce to simmer 15-20 minutes, stirring occasionally, until thickened. Bring heat up to medium-low. Return the chicken and juices to the pan and cook 10-15 minutes until warmed through and sauce is thick. If thinning is needed, add more chicken broth. Remove from heat and stir in cilantro. Serve with warm basmati rice and naan bread. PIN THIS HOMEMADE CHICKEN TIKKA MASALA FOR LATER!